Bed And Breakfast11840 sq. ft.
Near the sea, ideal position to visit the South-Eastern Sicily, beaches. The Bed And Breakfast Marricriu welcomes its guests in an environment appropriate to the name that means just refresh, riconfortarsi, revive and IE give refreshment to weakened body and mind. Looking for the etymology of the word "Marricriu" I found out that "Recreation" It can also be said ricriarsi much like the Sicilian term that I felt as a child, and that my ears sounded roughly "arrichiarsi", which is actually arricriàrisiand that means broadly feel pleasure, or even be sated, satollo, awaited, fed, riconfortato me, revived: animum or mentem recreare, or recreare tenuatum corpus, i.e. give refreshment to the body weakened. The Bed And Breakfast Marricriu site Avola is located in a strategic position, not far from the Sea (300 m) in a quiet and reserved. Marricriu bed and breakfast's rooms are all air-conditioned and double rooms (with extra bed – children added on request), WiFi, tv, mini bar, desk, safe, en suite bathroom with hairdryer, amenities and towels supplied. "Marricriu" also offers an outdoor area with parking, pool area with lawn and large veranda for breakfast, all designed to make guests feel comfortable and hospitable environment. "Marricriu" also being close to the A18 allows all those going on vacation like move to visit our places rich in art, history and culture, easy access to Noto, Modica, Ragusa, Syracuse and the whole area of Catania, Taormina, Etna, building on even the food culture that provides the area with its flavors that only the Sicilian tradition can offer. Il mio nome é Illary una ragazza semplice, solare, figlia di un noto ristoratore di Avola, Giampaolo , e di una splendida donna, Michela, che hanno cresciuto me e mio fratello Sebastian all'insegna della disponibilità e della cortesia. "Portomatto" è il nome del nostro ristorante-pizzeria dove è cresciuta in me la voglia di dialogare e regalare un sorriso a chi viene a gustare le nostre specialità. Mi piace la musica il cinema e la buona cucina. It is a lovely, clean and welcoming B & B, with good rooms, a beautiful pool, and a charming host. Illary made us very welcome, and we enjoyed every minute of our nine day stay. After a chilled out fresh breakfast, we were able to visit the numerous attractions in the area, sometimes a cultural visit, sometimes lounging on the beach. At the end of every day we spent a few hours around and in the pool, reading and cooling off, before showering in the lovely en suite and walking to the family restaurant (just down the road, beside the beach) for our evening meal . It is a family business, and all the family are lovely. Absolutely perfect for all the family including our 17, 20 and 22 year olds! Quiet and superbly kept villa with beautiful grounds and pool close to bars , restaurants and beach all within walking distance. Illary is so welcoming and helpful in every way. The family restaurant Portematto is also excellent and walkable. Thank you Illary and Giampaulo. We loved our first visit to beautiful Sicily and will be back. God lejlighed med meget store rum. Haven er skøn og har en virkelig dejlig pool. Hus og have vedligeholdes dagligt af værtsfamilien, som er meget venlige og hjælpsomme. Lejlighed og have ligger i rolige omgivelser, men alligevel tæt på sandstrand og byen. Super séjour! A recommander sans hésitation! Illary is een supervriendelijke, enthousiaste gastvrouw die de B&B runt met heel haar hart. De B&B is nieuw; de kamer en badkamer zien er erg mooi uit en het ontbijt is heel uitgebreid. Het zwembad wordt dagelijks schoongemaakt en ook aan de tuin en het terras wordt veel zorg besteed. Er zijn een paar fietsen die je gratis mag gebruiken. Het familierestaurant ligt op loopafstand. De B&B ligt heel centraal om dit deel van Sicilië te bekijken. We waren er maar 3 nachten wat dus eigenlijk veel te kort was! (Text automatically translated) Highway Exit Avola, follow towards Lido di Avola, PORTOMATTO meeting at the restaurant for a quick refreshment, after the owner of the "CLASSE'60'80" will accompany you in the 500 mt. 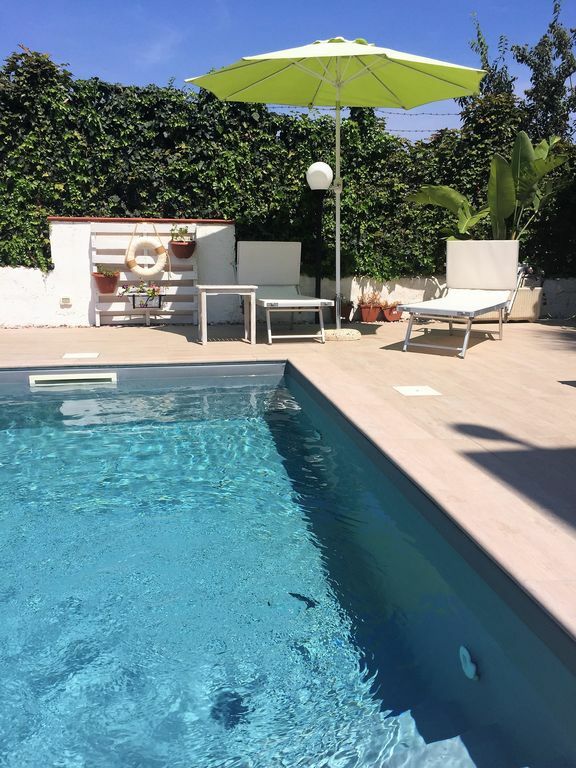 (Text automatically translated) The location of the house is very quiet, but close to bars, pizzerias and local restaurant (Portomatto), ice cream parlors, supermarkets, post office, newsagent, pharmacy etc. .. about 100 meters there is a great bike path and pedestrian ideal for jogging, skating rink, rides for children. Ideal location for excursion 5 km from Noto, 20 km from Siracusa, 15 km from the "reserve Vendicari", 20 km from Capopassero, 5 km from the natural reserve of "Cavagrande", excursions (also organized) day in Taormina , Etna, Valley of the Temples (Agrigento), Palermo, Erice. Tariffe scontate in relazione alla durata, Acconto richiesto alla prenotazione.